When I think about how to go about applying a specialty paint finish on brand new pine, I first consider how an authentically aged piece has evolved over time. It’s the result of wearing and weathering — so it seems counter-intuitive to add layers of paint to achieve this look (it’s like when you apply too much makeup on your face – the more you add, the less natural it becomes). 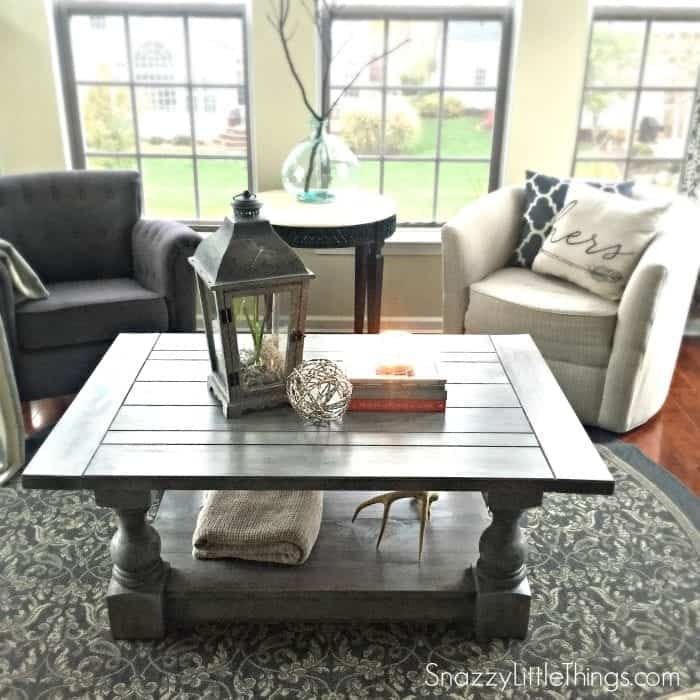 Recently we built our own mock-Restoration Hardware Monastery table, and I wanted to achieve the same weathered finish with a little bit of grey, weathered, driftwoody tone. 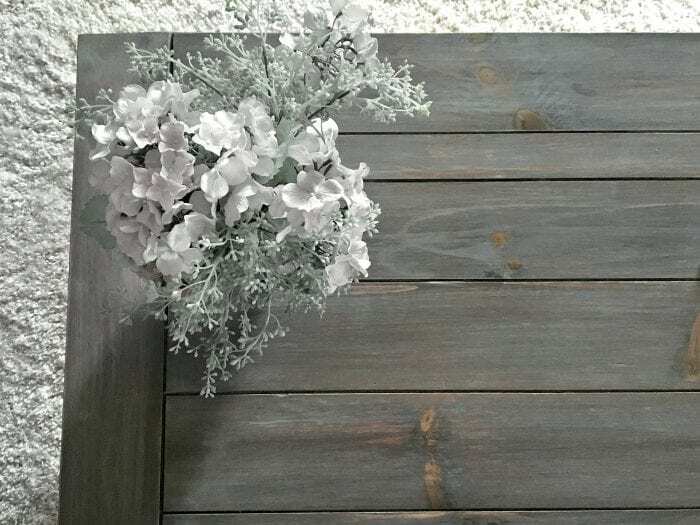 To achieve this look on new pine, we used stains that soak into the wood. In our case, we were starting with plain, new pine. By darkening the wood, it makes it appear older, and the stain soaks into the wood and dries very quickly. I love that it doesn’t feel tacky when it’s dry, which is what you sometimes get when you apply an oil based stain. 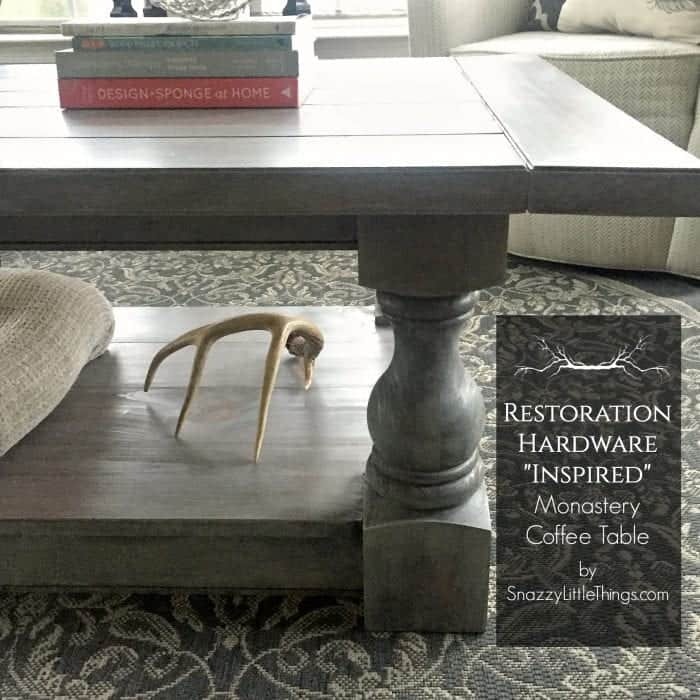 In our woodshop this is our “knocked-off” Restoration Hardware Monastery Coffee Table. At this point, the wood was sanded and ready for the next step. 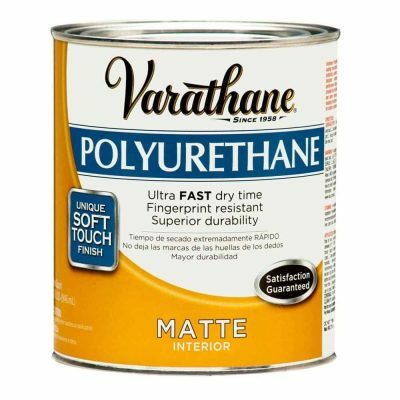 You can choose any dark stain, but my personal favorite is Varathane Dark Walnut. We brushed it on heavily with a nylon brush and let sit for about 5 minutes. Then we rubbed it into the wood by hand, removing excess and ensuring that the wood was completely covered. Let dry overnight (AND BE SURE TO WEAR RUBBER GLOVES). Tip! If you do get stain on your hands, I’ve discovered that nailpolish remover works wonders! I let soak into the wood for not more than 5 minutes. Then, use a dry cloth to evenly and lightly wipe Sunbleached stain into the wood (by hand…again, gloves!) and remove the excess. 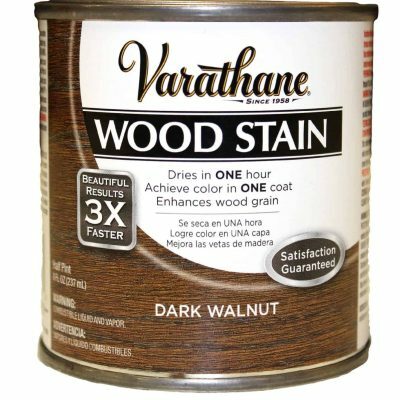 The goal is not to rub hard, something I discovered is that it will remove portions of your dark walnut stain underneath — you want to use the cloth (in place of the brush) to give it an even finish overtop of the walnut stain. In the end, we liked our finish with the variation of color. I’ve also tried applying the stain and just leaving it dry for 24 hours. I love both looks. After Step 2 is complete, if you want more variation of colors, you can “dry brush” the Sunbleached finish in a cross-hatch application (in quick “X” patterns) using a barely-wet synthetic brush. Make sure the brush is MOSTLY dry. My method: I would cross hatch followed by dabbing with my wet cloth. This is the effect that you get — a beautiful driftwood finish. See how you can see a nice combination of light and dark wood tones showing through? And just a few “dabs” and “cross-hatch” effects are visible, too. Congratulations! You’ve finally achieved the perfect driftwood look. Now, there is just ONE more–but very, very important (and simple) last step. Apply a matte polyurethane. This particular brand has a milky white finish at first. BUT DON’T PANIC!! It dries clear. I chose matte to keep it looking as close to natural driftwood as possible. 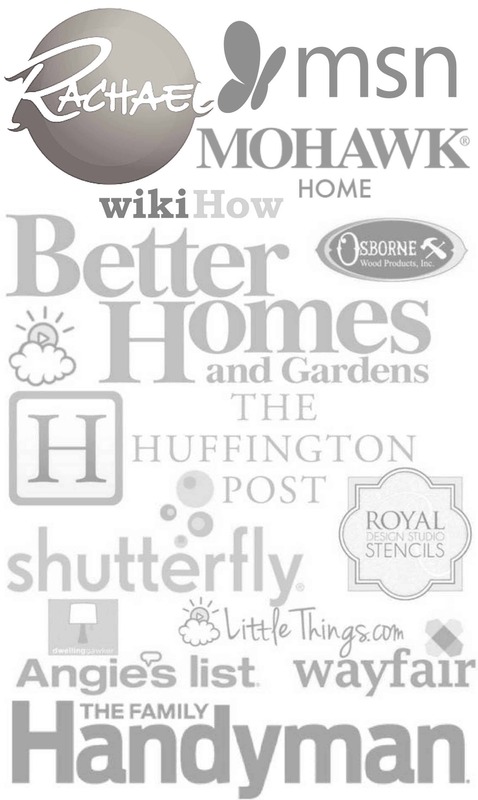 Free building plans and printables are available for subscribers to my blog. Hope you’ll follow along with us this year as we experiment with more furniture builds and fun paint finishes! Thank you for this step by step tutorial. I’ve been debating how I am going to attain the a natural driftwood effect for my bureau. You’ve achieved it masterfully! Unfortunately, I wasn’t able to pin it. Can you recommend how to save this to my Pinterest board? Love this technique. Must give it a try! Thank you Christina! It’s holding up perfectly, too. No chips so far and we use this table all the time. I appreciate your feedback! I’m known as the neighborhood stripper, due to the constant pieces in my garage being stripped, sanded or at some other stage of “refinishing”. I sell about 20-25 pieces a month and it take a lot of time. Can’t do it in the real cold weather, like now. I love this look so much. 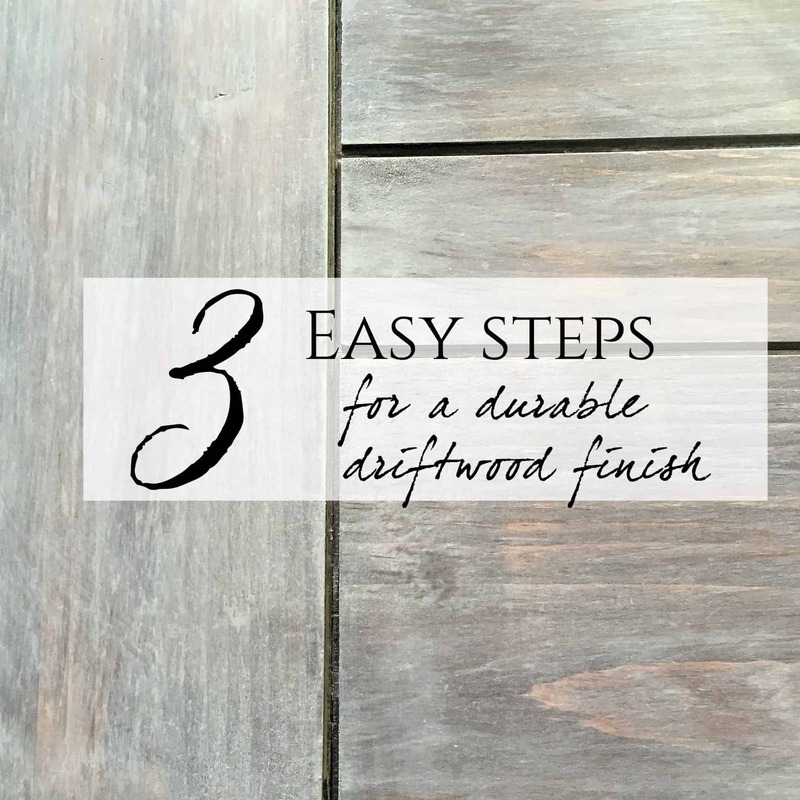 Question….if I am starting with store bought furniture do I sand first before starting the three step process? It is a bedroom set that my husband had in high school and I want to make it over for my son. Thanks! Crystal, I replied via email, let me know if you received it. 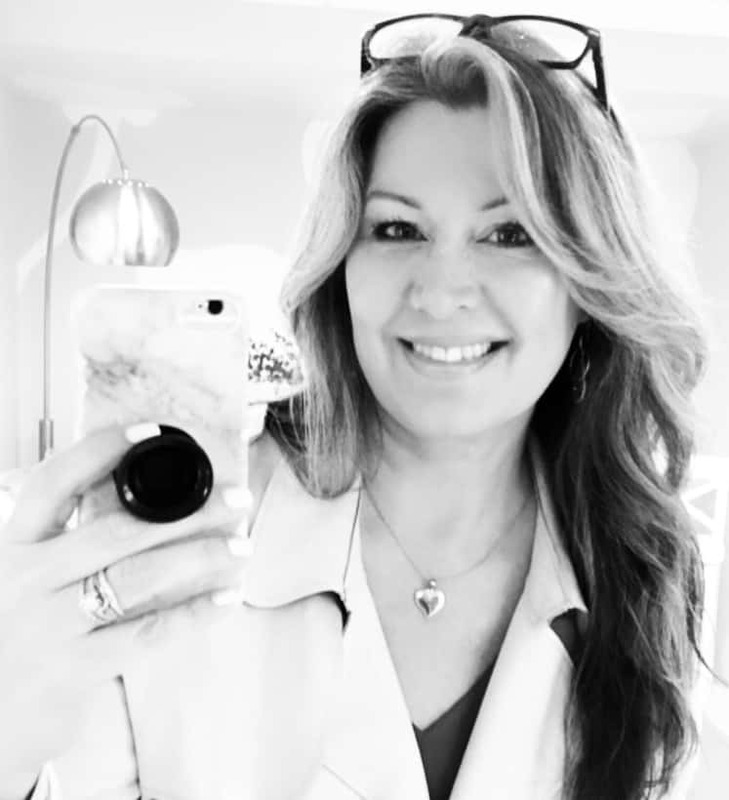 Thanks so much for taking the time to comment! Wow – what a gorgeous finish! I’ve been looking for the “right” driftwood look, I’m so damn picky, lol. This is it. I’m starting with a cedar chest though, after sanding off the finish that was too dark. We’ve got it down to bare wood so I’m really hesitant about re-staining with the dark prior to the sun bleach…..Should I go a little lighter for the base, considering it’s going to look darker on this red-toned wood?? 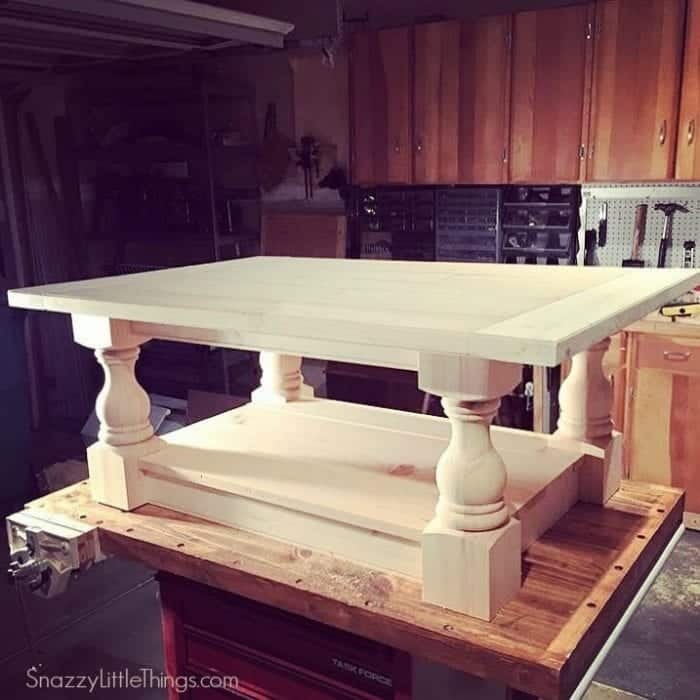 I had the same question about using this technique but with night stands that need to be repurposed so I will need to strip the stain that is currently on there. Would I use the same colors and technique after that? Or look for a lighter color also to start with? Thanks! Where can you find the water based version of the stains? I was looking at Home Depot online but it only explains oil based. I followed the first two steps and I feel like my makeup vanity turned out horrible, I was just wondering if someone had an idea of what I could do to make it look as beautiful as this picture? My colors came out in two shades dark and light, I didn’t get the other pretty color showed in the picture, I used both stains recommended. Hollie, If your vanity already had a finish on it, that could be the problem. This tutorial is how to work with plain pine. Is that maybe what happened? Thank you for this tutorial. I have been looking for almost a year for a way to make my own planking to redo the floor in my mfg home without spending a million dollars. A cat lives with me and they can not tolerate the fumes from these products so I will do all of the finishing out in the garage and then install it as I would purchased flooring. Can you suggest a low voc product that I can use as a final topcoat to seal the joints between the boards? So I went over it with the unbleached and I’m thinking it looks lighter than your table. I like that yours looks darker. I’m wondering if the poly would darken it a bit, or maybe I should just add a little steel wool-vinegar to darken a bit, then poly….? This is the color I’ve been looking for for my kitchen cabinets ! They are oak cabinets. I’m wondering, if I sanded them down, if this process would work on them. 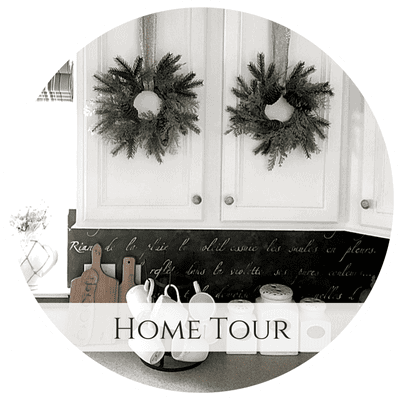 I would actually like to use this process on the top cabinets and paint the lower cabinets a dark gray. What are your thoughts about this process for kitchen cabinets? 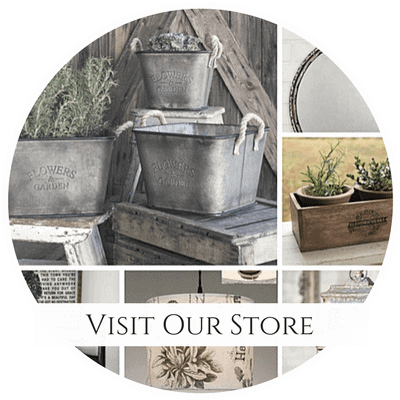 I absolutely love your style and your site. I love the clean lines, yet coziness of your home. It is everything I would love for mine! Hi Karen! I emailed you directly about this, let me know that you received my reply! 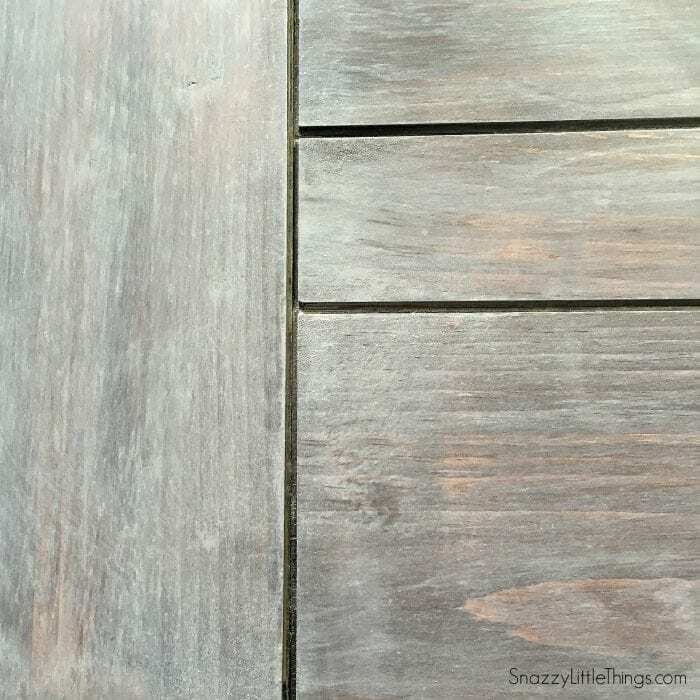 I am revisiting this post to review everything before starting my floor project. I noticed that the close-up picture is a lot lighter than the pic of the entire table. I want the floor to be the lighter shade. Which is the actual tone? Could I lighten it by putting on another coat of the lighter color if it is too dark? Hi Sharon, if your floor isn’t new pine, I don’t recommend this tutorial. Please let me know. This tutorial was intended to show how we make new pine look weathered. I am refinishing a kitchen table and it is not pine. 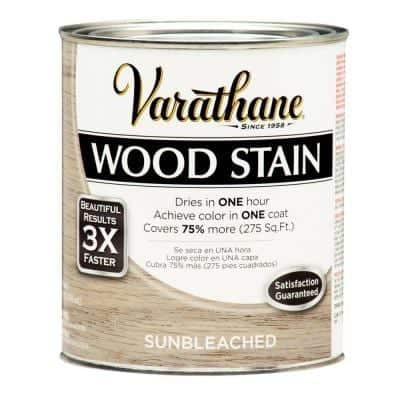 If I sand off all the varnish to the bare wood will this work? I am not sure what kind of wood. It is one of the 90’s “orange wood” tables. Thanks! I would test the underside of your table first, especially since my tutorial was focused more on how to stain new pine. When you’re applying stain overtop of stain, I would definitely sand it down to bare wood. 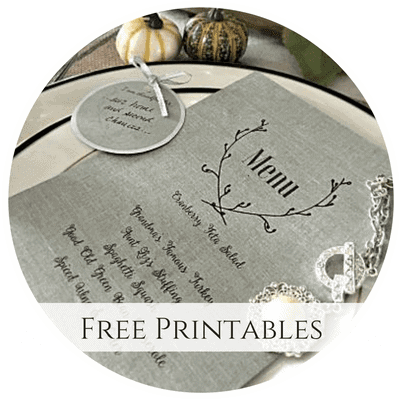 However, be sure your table isn’t a wood laminate (not plastic, but a very thin layer of wood). You don’t want to sand through that laminate layer. I hope this help! Love this coffee table and I am already a subscriber to your blog. would love to get the plan for it! Can you help me? Hi Joan! Glad to hear from you thanks for your kind words. I think we have plans but I’m away from the office this weekend. I’ll search my archives and will let you know once I have them loaded in the subscriber library. What is the difference in the look between the two approaches that you took in step 2? Thanks. Hi Joni, I emailed you the two photos and will add them in the post as well. I love this color/look. Always wanted to obtain this look, but did not know how to achieve it. Thanks to you I can now create this look, and hope it will look fabulous like yours. Hi Ivory! Thank you, it’s really an easy and extremely durable finish. We love this look. I love this technique! After you apply the Sunbleached over the Dark Walnut do you leave it to dry for 24 hours then do the cross hatch? pieces and the finish still looks great! Good luck! Great Jeanette! Thank you so much!